This page contains the Pokedex Data for Amoonguss, including base stats, type defenses, abilities, evolutions, move list and location in the games. 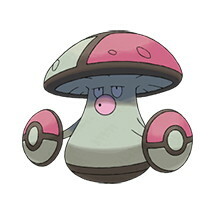 Effect Spore The opponent has a 10% chance of being induced by PARALYZE, POISON, or SLEEP when using an attack, that requires physical contact, against this Pokémon. Regenerator When the Pokémon switches out of battle, up to 33.3% of its maximum Hit Points are restored.